In the third century BC, Aristotle penned the timeless words, “The more I know, the more I know I don’t know.” Since then, countless people in numerous time periods have restated this realization using various wording. Aristotle’s statement and the others like it are the hallmark of those who are recovering casualties of the Dunning-Kruger Effect, a phenomenon explored in a series of experiments by David Dunning and Justin Kruger at the Cornell University Department of Psychology in 1999. These experiments—reportedly inspired by a bank robber who knew that lemon juice could be used as invisible ink and covered his face in it thinking it would render him invisible—set out to test a human psychological trait many before have witnessed: People with below average skill or knowledge tend to grossly overestimate their own abilities. Skydivers are essentially recognizing this trait in those they call “200-jump wonders” (or 100-jump wonders or 500-jump wonders, depending on the situation). These skydivers could be the most dangerous in the sport, not simply due to their errors in estimating risk, but also due to errors in estimating their own skills. They may simply not know a risk exists and get in over their heads unwittingly. Or worse, they may understand the risk but assess their own skills as sufficient to handle it. Worse yet are those who exhibit the second element of Dunning and Kruger’s hypothesis: Those who lack skill fail to recognize it in others. This plays out in an arrogant confidence that usually ignores, laughs off or even rejects advice from competent authority. Once, when discussing the advantages of taking a canopy course among a group of skydivers with 500-1,000 jumps, one of them scoffed at the suggestion that it was educationally beneficial for those of any level of experience by proclaiming, “Take a canopy course? I could teach one!” This type of obliviousness is an earmark of those suffering from Dunning-Kruger. There is another leg of the Dunning-Kruger theory that points toward the unproductive cycle of lost opportunity. On the opposite end of the spectrum in the experiments, people with true ability tended to underestimate their relative competence. This error in judging one’s own abilities should not be confused with humility, either real or contrived. Often, as their depth of understanding grows, competent people begin to recognize the vastness of their chosen industry and begin to see how their personal body of knowledge pales in comparison. This plays out in skydiving in multiple ways. For example, an S&TA chosen for his expertise and good judgment might lack confidence in asserting his opinion in a situation that calls for it, correctly anticipating backlash from the confident incompetent. Instructor Examiners may see inefficient coaching or completely inconsistent training programs yet back away from being mentors and making suggestions for small things that lead to big change. A drop zone owner who realizes how much more there is to know about finances, marketing, leadership, organization, culture, rigging, aircraft maintenance, regulation, etc., might not recognize the vast skills and experience already at his disposal and hesitate to effect real change in the face of overwhelming tasks. So the cycle continues: The confident inept ignore the quietly competent. Recognizing the Dunning-Kruger Effect, there are a few things each of us can do to break this cycle that inhibits our progress and blocks our potential to achieve amazing things together. 1. Realize that no one is immune. 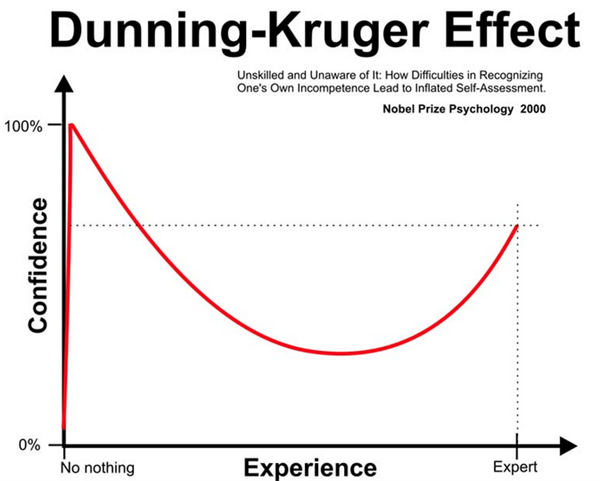 The Dunning-Kruger Effect has afflicted almost every single skydiver at one time or another. Fortunately, most of us are able to emerge through this period unscathed, likely due to quiet competence from mentors who themselves previously endured. So, what does it feel like to be wrong? It feels exactly like being right. Because in the moment before you realize that you’re wrong, you are still actually wrong. Think of Wile E. Coyote chasing Road Runner off a cliff and suddenly realizing he has not been running on solid ground for the last 50 feet: For the few seconds prior to that realization, he felt like he was right. That realization that being wrong feels like being right goes a long way toward shedding the use of feelings to gauge correctness. It helps us keep perspective, not take ourselves too seriously and open up our minds to the possibility of changing it. Open communication is key to the flow of information, which in turn addresses the crux of the Dunning-Kruger Effect: Those with correct information are hesitant to speak up, and those with shortsighted or incorrect information are outspoken. The standard policy for encouraging open communication is, “If you see something, say something.” However, just because someone says something doesn’t mean the other person heard it. The best way to start a back-and-forth dialogue is with a question instead of a statement. This catchall works in two ways. First, if you are a member of the confident incompetent and use a question to start off a conversation about a topic in which you think you are well versed, you give others the opportunity to contribute to your knowledge base, as well as spare yourself embarrassment as you discover someone actually knows more than you. Second, if you are a part of the quiet competent, you are more likely to have others engage and listen to you if you involve them instead of simply stating what you know. You’ll find your answer more widely accepted if you pose a question then find the answer together in a resource such as the Skydiver’s Information Manual or Federal Aviation Regulations instead of stating a fact bound to be rejected by someone who thinks he knows more than you. In this way, you’ll also reinforce that references are the standard, not people. 3. Recognize skill in others. The second element of Dunning and Kruger’s hypothesis hinges on the inability of those who lack skill to see it in others. Let’s say you are unwittingly suffering from the Dunning-Kruger Effect. Forming the habit of recognizing skill in others may help propel you more quickly toward enlightenment. If you are part of the stoic skilled, then recognizing skill in others connects you to other people and inspires you, focuses on the positive and opens paths to learning. It is easy to get into a habit of finding the negative aspects of a system. You don’t like how that instructor teaches the flare. You could pack way better than that rigger. You know more about canopy control than that competitor. First of all, check yourself to see if the assessments you make are about yourself or others. Then see if you mostly criticize and compare your superior skill to theirs or if you mostly find something they do that you want to adopt in your own skydiving. Taking the latter route will help you better identify true skill in others. Skydiving is such a vast activity and keeps developing in ways the pioneers of the sport never imagined. There are endless ways to keep learning, stay fresh and motivated, and retain the wonder of being a student of the sky. Yet pursuing ratings for the sake of a few more letters on your membership card is not the same. There is a big difference between collecting fresh skills and mastering one. Many well-intentioned skydivers choose to take on the humble practice of continual improvement and an attitude of always learning something new. However, learning a brand-new skill has a steep learning curve that makes it possible to take on many new things without ever reaching the ability to apply or synthesize those things. True mastery occurs when you deepen and expand a skillset you already possess. Along that pursuit, you may reach a plateau where you see little progress, and the learning curve is shallow. There is, however, a much more quiet yet satisfying achievement in pursuing mastery. Even those with 3,000-plus skydives will average about 48 hours of freefall time. Since when can you spend the equivalent of one workweek (with maybe some overtime) on a job and say you’re an expert? 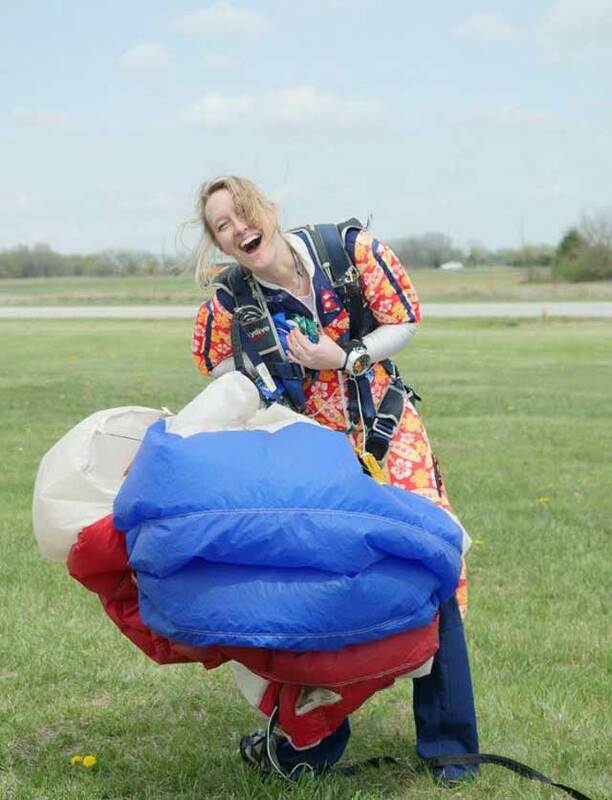 All skydivers have so much more they can learn. And the more they learn, the more they’ll see what it is they don’t know. You’ll never be able to experience all that skydiving has to offer, so embrace the small piece that you have taken on and slowly try to take more in. Even those who are not beginners will begin again and again in the process. But how can you tell if you are suffering from the Dunning-Kruger Effect? Assess your reaction to this article. If you are thinking, “Wow, I have seen that in other people and even myself! I think I could use some of that to improve myself and grow,” then you have nothing to worry about. If you are thinking, “Wow, I have seen that in other people... good thing it doesn’t apply to me! I’ve never been that way,” then start worrying.